LifeNut who recently set the world record for his age in the half-marathon in April in Knoxville. Mike hopes to break his record of 3:03:56. And, running, or even walking, at a brisk pace of 15 minutes per mile, might be enough to beat him. Maybe. Americans spend 2.6 trillion dollars a year – or 50 million a week – on health care. Much of this cost goes to treat obesity-linked diseases – cancer, diabetes, and heart disease. And, as obesity rises each year, so does national health care expense, which adds to the bill that will pass on to younger generations. If everyone one does his or her share, Americans can lose weight together in this LifeNuts challenge and help reduce our country’s debt! those who want to discover how Mike does it, he’ll be writing a weekly blog about his daily training as well as a few other tips about his lifestyle. This will be posted each Monday, beginning on June 3, on our blog page. Yes, a half-marathon can be intimidating to most people but it’s much less scary than a regular 26.2 mile marathon, a race where Mike recently set a new age record. Regardless, 13 miles is 13 miles and for some it seems impossible. But, for most people it’s within reach. Yes, it is. Consider Ben, a terribly obese (358 pounds) young man, seemingly going nowhere in his life. Suddenly he decided to change and get healthy and began to run, a journey he documented in a YouTube video. I cry everytime I watch this. And, if this doesn’t motivate you to change your lifestyle, nothing will. Be sure to turn up the volume. But a word of caution. If your friends are very overweight (consult BMI tables), they should check with their physician before starting. They should also consider going to the local running store for an evaluation for proper running gear – especially shoes. Too often injuries happen without proper footwear or from going too fast, too soon. And, most running stores or running clubs would be willing to provide a realistic training program. With five months to prepare for Mike’s challenge – June through October – most overweight people could successfully complete this half-marathon. Please ask your overweight friends to record their weight on June 1 and keep track so that they can tell us how much they’ve lost by race day, November 2. At the marathon expo on Friday (Nov. 1), Mike and I will be giving a presentation and we would love to hear how your life has changed and how much weight you’ve lost. The LifeNuts program, modeled after Fremont’s lifestyle, is free for any community to use and is designed to save budget dollars by reducing municipal health care costs and absenteeism. Even though the picture of old age in America implies dementia, wheelchairs, and nursing homes, Mike Fremont’s life shows that old age can be a time of happiness, health, and service to community. In fact, Mike also set a world record in the marathon (26.2 miles) last November in Huntington at the Marshall University marathon. Not bad for a 90-year-old! For registration, directions, and lodging information, please visit the website of the Indianapolis Monumental marathon. The good news is that the course is fairly flat and it’s also staged at a time of the year when the weather is normally cool, ideal for running. We hope to see you there! 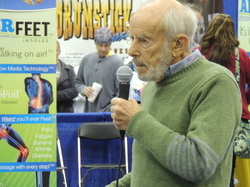 At the Indianapolis Monumental marathon expo, Mike and I gave presentations on his lifestyle that allows him to not only run marathons and half-marathons in his 90s but to deliver his message with conviction to any audience that's willing to listen (and most are). As usual, the pretty young female runners wanted their photo with Mike, an unabashed ladies man, and one lady brought her copy of Mike's article in Running Times for him to autograph. I suspect she'd like to be running in her 90s also. We also spoke at the marathon pasta dinner. Unfortunately, despite a flat course and perfect running temperatures, Mike did not break his world record that he set in April. He had a few mechanical problems, one of which was an injured shoulder that needed surgery, which he considerately postponed until after the marathon. But his time of 3:24 was good enough to beat 100 other runners in the half-marathon. So, he wasn't even close to being dead last. And, at 91, he again showed us that 13 miles didn't phase him a bit. So, now you're thinking, I wonder if I could beat a 91-year-old? Go to our blog of November 8 and see what your fitness age is, which might help to answer that question. Mike's fitness age is 54. On the flip side, some 50-somethings have a fitness age in the 70s. Sorry, but let's face it: obesity is America's new normal. And trust me, we're all going to pay for it - as well as our children and our grandchildren. Obesity and its related diseases, cancer, diabetes and heart disease cost American billions each week. As Barron's late Alan Abelson aptly stated, "The eat, drink, and get sick industries are all doing well." Let me offer a new challenge to you or to your friends or relatives who are overweight: Are you faster than a 92-year-old in the IMM half marathon? - scheduled for November 1, 2014. If Mike's health cooperates and if the race director will put up with these two old guys again, we'll be back in 2014. Mike turns 92 in February, which opens new opportunities for world records and more places to share a lifetime of knowledge with the rest of us. So, get off the couch right now. Forget the excuses. If you're like the average American, you spend five hours a day watching TV and who knows how much time sitting while doing electronic stuff. Make time for your health ... before it's too late. Believe me, the 50s and 60s approach faster than you think. How do you begin the program. Go to your local running store and explain your goal: you want to beat that old fart Fremont in the IMM half. No one will make fun of you if you're obese. Runners respect all people who try to become runners. If they don't, find a running store where people give you respect. Read Mike's blogs to check out his training and his nutritional habits, which make a difference. And start slowly and keep going. Don't try to run until your BMI is at least in the upper 20s and don't get discouraged if something hurts: just wait for it to get better. It will. Stay tuned.